Vaccinating with new vaccines should save many more lives, but high prices could prevent this from happening. Each year, the lives of two and a half million children are saved because they are protected against killer diseases through vaccination. Vaccinating with new vaccines should save many more lives, but high prices could prevent this from happening. When vaccine prices are high, fewer vaccines are purchased, and fewer children are vaccinated. 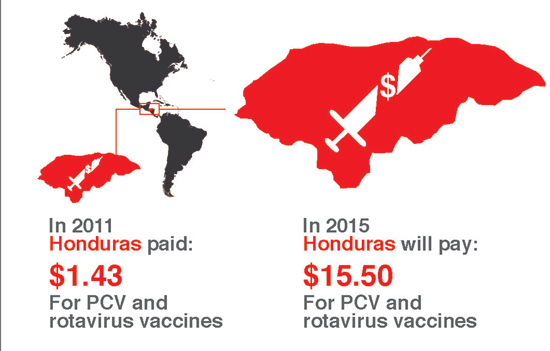 Ten years ago, it cost countries less than US $1.50 to buy the main recommended vaccines to protect a child’s life. But today, the lowest price for the recommended package of vaccines has risen to nearly $40. That’s because not only are more vaccines now included in immunization programs, but many new vaccines cost much more than older traditional vaccines. Two new vaccines alone—against rotavirus and pneumococcal disease—now make up around three quarters of the total cost of vaccinating a child. While adding more vaccines to the basic package is a good thing, these high prices pose a threat to the sustainability of efforts to get more children protected. Most children in developing countries would not be able to benefit without the substantial financial support they currently receive from the GAVI Alliance. GAVI, a public-private partnership* set up over a decade ago, was specifically created to finance the introduction of new vaccines in developing countries and support basic immunization activities. GAVI has committed more than $7.9 billion to developing countries’ immunization programs. Developing countries are only eligible for GAVI support if their national income levels remain below a certain threshold. Once countries’ per capita income exceeds $1,520, they start to ‘graduate’ from GAVI support. At that point, countries are hit with a double burden: they no longer receive subsidies from GAVI, and at the same time they also lose access to GAVI-negotiated prices for newer vaccines. So What Happens When Subsidies for Newer Vaccines Run Out? In 2015, sixteen countries—just under one quarter of those currently eligible for GAVI support—are due to graduate. As graduation from GAVI approaches, countries are asked to pay incrementally more each year. The idea is to reduce the financial shock of withdrawn subsidies by gradually weaning countries off GAVI funding. However, whether gradual or not, the final withdrawal of GAVI funding will present many countries with considerable financial challenges—a bill they will find very hard to foot. Many vaccines have to be kept at very low temperatures to remain effective. This means that a ‘cold chain’ of refrigerators and cold boxes has to be set up and rigorously maintained—a very expensive operation. The cold chain requires considerable logistical resources to keep vaccines cool in places where power supplies are unreliable and daily temperatures can soar to 45°C, particularly in the remote and hard-to-reach areas where many communities live. Ethiopia found out about the high attendant costs of cold chain when it introduced the pentavalent vaccine, which offers protection against five childhood diseases, into its national immunization program in 2007. In order to introduce this one vaccine, the country had to more than double its national capacity to refrigerate products. Could Vaccines Be Made More Affordable? In today’s economic climate, international funding to meet the higher prices of new vaccines is unlikely to increase. To reach more children, what we need to see is vaccine prices coming down to more affordable levels. Some countries are paying far too much for vaccines. South Africa, for example, pays much higher prices than other purchasers in developing countries for many vaccines. One factor influencing these high prices is that South Africa has to negotiate vaccine prices in isolation. Working together to pool their purchasing, and thereby create larger markets, gives countries powerful leverage with companies. The Pan American Health Organization (PAHO) Revolving Fund and UNICEF Supply Division are able, for example, to exert the most pressure on companies through the huge markets they represent. Growing numbers of suppliers who have received quality approval by the World Health Organization in countries like India are able to undercut the high prices of traditional multinational companies. The costs of manufacturing facilities are estimated to account for 60 percent of all vaccine production costs. Together with labor costs, these are radically lower in, for instance, India, compared to costs in Europe or the US, so producers in the developing world can deliver substantial savings. For instance, the best price Pfizer and GlaxoSmithKline charge for pneumococcal vaccines—only available to GAVI—comes to $7 a dose, making a full three-dose course $21 per child. Yet a competitor predicts it could make the same vaccine for as little as $6 for a full course. Another example of the effect of competition from lower-cost producers is pentavalent vaccines. GlaxoSmithKline and Crucell announced a 15 percent drop in the price of their pentavalent vaccines when more affordable products from several Indian producers became available. And prices are forecast to fall lower still. Until recently, few vaccine prices were publicly available, as companies in the vaccine market were particularly unwilling to share information. This means countries had very little information with which to benchmark prices and negotiate deals. 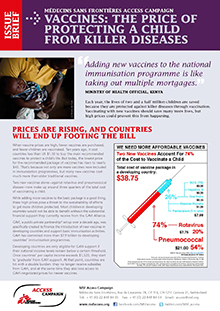 But in 2011, with advocacy support from MSF, UNICEF Supply Division set up a publicly accessible database of the prices it had paid for vaccines over the last decade, making it clear to countries which products can be bought at which prices. It became immediately obvious to countries, for example, that the multinational company Crucell was charging 40 percent more for its pentavalent vaccine than the Serum Institute of India. MenAfriVac—a vaccine against meningitis—was launched in Africa’s Meningitis Belt in 2010. Designed and developed specifically to protect against Meningitis A, the prevalent strain in the region, the vaccine has already saved many lives by preventing outbreaks, and is expected to save many more, as it is rolled out more widely. The vaccine costs only $0.50 a dose. How was it possible to create a new vaccine at such an affordable price? MenAfriVac was developed using an innovative model that from the outset made the needs of the target population the priority. Thanks to technology transfer to the Serum Institute of India—a manufacturer with lower labor and capital costs—and a decision to keep the product simple and target the relevant serotype, the project was able to show that new vaccines don’t have to be unaffordable. In that sense, the MenAfriVac model is an enlightening contrast to the Advanced Market Commitment (AMC). The AMC is a financial model used by GAVI to accelerate access to pneumococcal vaccines in developing countries. In exchange for subsidies from GAVI, Pfizer and GlaxoSmithKline sell the vaccines at far lower prices than they charge in industrialized countries. But in order to convince the two firms to invest in greater production capacity to meet the demand from developing countries, GAVI has had to set generous terms: the companies will pocket the lion’s share of a $1.5 billion subsidy paid by GAVI’s donors, and once this subsidy has run out, will be able to charge a price for the vaccine that remains higher than what a manufacturer with lower costs has said it will charge. The AMC is an illustration of the limits of relying on high-cost manufacturers in bringing vaccine prices down, when spending money to ensure competition from lower-cost producers could bring about a better long-term result. The global vaccine community should do more to ensure that bringing high vaccine prices down is part of the wider strategy to increase access to vaccines, so that many more children can be protected. GAVI, UNICEF and others involved in vaccine procurement should use their purchasing power to further drive prices down. More lower-cost manufacturers should be encouraged to enter the vaccines market, including through technology transfer, in a bid to develop affordable products. Countries buying vaccines should pool their orders to increase their purchasing power. UNICEF and others should continue efforts to increase vaccine price transparency. GAVI prices should be extended to non-governmental organizations working in the countries it supports. Each year, MSF teams vaccinate over ten million people, primarily as outbreak response to diseases such as measles, meningitis, diphtheria, pertussis, and yellow fever. MSF also supports routine immunization activities in some projects where we provide healthcare to mothers and children.